On January 25, 2019, the Córrego do Feijão dam, a tailings dam for an iron ore mine in Brumadinho, a Southeast city in Brazil, collapsed, leaving 134 people confirmed dead and 199 people missing, with little hope that they will be found alive (Agence France-Presse, 2019). Tailings dams are dams that often accompany metal mines. Metal mines, such as the iron ore mine in Brumadinho, leave behind rock waste that has been ground to sediment, using a significant amount of water in the process. The sediment and excess water are deposited into what are known as tailings ponds, and the purpose of a tailings dam is to hold all of the material in the ponds from flooding the land around the mine with sediment and mud (Penner, 2014). When the Córrego do Feijão dam collapsed, approximately 12 million cubic meters of iron tailings were released, inundating and burying the mining company’s offices, two other dams, entire villages, railways, and streets. 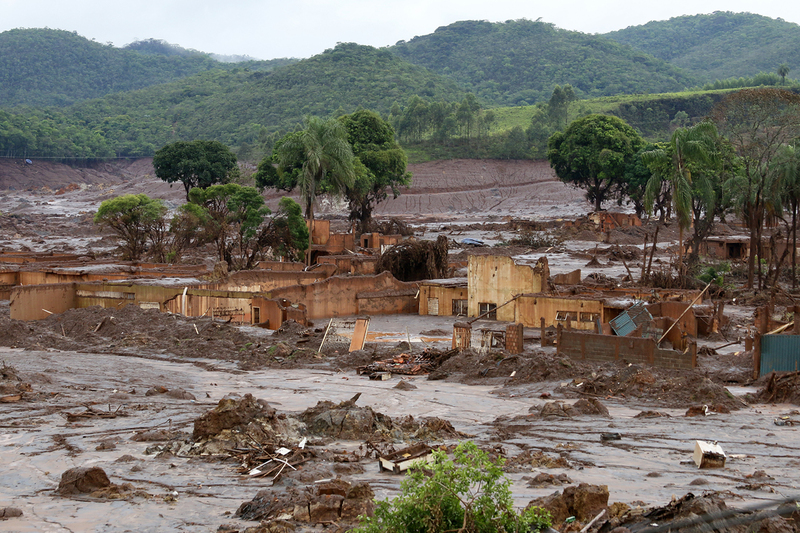 The thick tailings mud also ran into the Paraopeba River, a source of water that supplies one third of the nearby city, Belo Horizonte (Jornal Nacional, 2019 The immense death toll as well as the environmental impact the dam collapse caused is considered the worst mining disaster ever to occur in Brazil (Osborne, 2019). The dam was owned by the Brazilian mining company, Vale, the world’s largest producer of iron ore and nickel. Following the dam collapse, Vale halted bonuses that were scheduled for Vale workers and made a statement that they would be in full cooperation with the authorities, as well as support the investigation and the families affected (BBC Latin America & Caribbean, 2019). This tragedy in Brumadinho happened only about three years after another similar disaster in the same region. Less than 200 kilometers from Brumadinho on November 5, 2015, the Fundão dam broke, releasing 50 million cubic meters of iron ore tailings, completely burying the village of Bento Rodrigues and killing 19 people. The Fundão dam was also owned by the same company, Vale, and caused the worst environmental disaster in Brazilian history, with the sludge reaching as far as the Atlantic Ocean (Jornal Nacional, 2019). Both dam collapses were deemed as “low-risk” for an environmental disaster before the tragedies occurred, yet caused immense environmental damage and human casualties. Worldwide, people are furious at the mining giant as workers claim they warned of the disaster weeks before it happened and believe that the disaster could have been prevented had it not been for corporate and federal negligence in certifications of infrastructure projects. According to some workers at the Córrego do Feijão dam, the dam suffered a leak one year prior that compromised the stability of the dam. The employees claim that “the mine’s operators did not inform the workforce or relocate a canteen and administration building that were destroyed in the disaster” (Phillips, 2019). Vale issued a statement the day of the collapse that during the dam’s most recent inspection on January 22, there was no leak and the dam was cleared as stable. One dam worker, Fernando Coelho, lost his father in the collapse. He recalled that his father had warned him for months to “steer clear of the dam” and that “[the dam is] going to burst at any time” (Phillips, 2019). Many of the safety regulations enforced in Brazil are nothing more than what amounts to a self-assessment. Though many agree that this is not an efficient or suitable standard for the safety inspection of dams and other infrastructure projects, Brazil’s national mining agency does not have enough staff to inspect every dam and therefore must rely on and base their data on companies’ reports of their own properties (Reverdosa, 2019). Both the Córrego do Feijão dam and the Fundão dam were built using “the upstream method” where the tailings are used to build the dam. Before the Córrego do Feijão dam collapse in 2018, a state assembly representative for Minas Gerais, the state where both dam collapses occurred, named João Xavier, proposed a state law that would have “prohibited 90% of the state’s ‘upstream’ dams and created more rigorous regulations for the rest” (Phillips, 2019). This bill was rejected due to the powerful lobbying influence of Vale. Three Vale employees and two safety inspection contractors were arrested following the dam collapse, and have offered to donate what equates to $26,500 USD to the families with confirmed fatalities or missing persons (Reverdosa, 2019). Contrary to Vale’s claim that the disaster was a tragedy but not the fault of the mining giant, Greenpeace Brazil says otherwise. The NGO believes that with two disasters happening so close to each other, it cannot be an accident and is instead a “crime against people and nature” (Reverdosa, 2019). These insufficient regulations and and obvious favoring of the interest of large mining companies has been battled in Brazilian politics for years. However, to accelerate mining operations the assessments have become progressively less detailed. President Bolsonaro even believes that the environmental regulations in Brazil are “too stringent: and he plans to cut back on Brazilian agriculture and environment ministries, though has not had enough support from the international community to do so” (Reverdosa, 2019). Brazil already has failing infrastructure projects that are lacking funding for approvement across the country. According to the World Economic Forum, Brazil is ranked at 72 out of 138 nations in terms of the quality of their infrastructure. The main issues behind Brazilian infrastructural problems are old projects without any funding for renovations, roads and bridges that are too small, and insufficient regulations. There have been some heavily funded projects proposed in the recent past such as the growth acceleration programme (PAC), which would include projects such as the creation of a bullet train between São Paulo and Rio de Janeiro, as well as mass housing for impoverished communities. Unfortunately, most of the funding for these projects was lost in ventures for publicity such as the 2014 Fifa World Cup, as well as “corruption-riddled refinery developments” (Financial Times, 2019). In fact, one of the largest and most heavily funded gas companies in the world, Petrobas, was involved in corruption of the federal government as high up as the Presidency in Operation Car Wash, which resulted in the undermining of the federal government’s ability and credibility to pursue further infrastructure projects (Financial Times, 2019). Though challenges for Brazilian infrastructure include the lack of regulations and improvements, the biggest challenge to improve upon these difficulties is that the government has no money to spare. Bolsonaro’s promise to shrink Brazil’s budget will only decrease the chance that any money gets sent towards the revitalization of Brazilian infrastructure. Though changes need to be made in the Brazilian economy in order to pull the nation out of recession, limited funding for infrastructure projects as well as corporate and federal negligence will only increase the chances of more disasters occurring like the Córrego do Feijão dam collapse. Agence France-Presse. (2019 Feb 5). "Toll in Brazil dam disaster rises to 134 dead, 199 missing". abs-cbn news. Retrieved Tuesday, February 5, 2019. Derrick Penner. (2014 Aug 12). "How tailings dams work". Vancouver Sun. Retrieved Tuesday, February 5, 2019. Jornal Nacional. (2019 Jan 26). "Técnicos avaliam extensão do dano ambiental de rompimento da barragem". Jornal Nacional. Retrieved Tuesday, February 5, 2019. Catherine Osborn, Fanny Lothaire. (2019 Feb 5). "Brazil's Brumadinho dam collapse, a disaster waiting to happen". France 24. Retrieved Tuesday, February 5, 2019. BBC Latin America & Caribbean. (2019 Jan 29). "Five arrested over Brazil dam collapse". BBC News. Retrieved Tuesday, February 5, 2019. Dom Phillips. (2019 Feb 6). "'That's going to burst': Brazilian dam workers say they warned of disaster". The Guardian. Retrieved Wednesday, February 6, 2019. Marcia Reverdosa, Sheena McKenzie. (2019 Feb 3). "Brazil's Brumadinho dam was certified 'stable' weeks before it collapsed". CNN. Retrieved Monday, February 4, 2019. Financial Times. (2019). "Financial TimesThe long haul to recovery for Brazil’s infrastructure". Financial Times. Retrieved Tuesday, February 5, 2019.